Hey, guys! I just wanted to tell you all I'm taking a little blogging break today. <<<======= See note for explanation! Anyway, hope everyone has a great Wednesday. I'll miss you guys!!! PS - Isn't that picture just so perfect and funny? 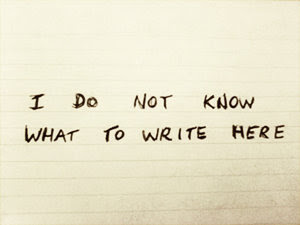 I hate when I have nothing to write about! It can be so frustrating! But I agree the note is so cute and funny!!! I love it! That is a cute little picture. lol. I'm not sure if I'll post anything today either. Depends on if I can decide which book to review. lol. I need practice with that! Jen - It is frustrating, isn't it? Oh well, what are you going to do? Happy Wednesday! Take a break! I know I could use one. Love the picture...classic and so appropriate! Enjoy the break! Melissa - I'm right there with ya. That's exactly what happened today. Happy Wednesday! Perfect picture! Can't wait for the answers and award day.